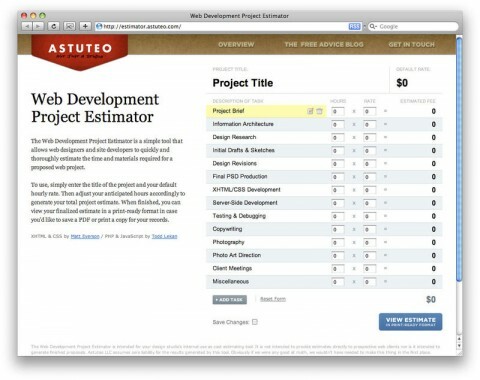 The Web Development Project Estimator is a simple tool that allows web designers and site developers to quickly and thoroughly estimate the time and materials required for a proposed web project. Neat! Know of any tool like this that is all-inclusive for a more general brand of graphic designers? We designed the tool so that you could use it, too. You can edit the form to suit your own needs and check the “Save Changes” checkbox at the bottom. It will save your edits via a cookie to your local machine so that your estimating form remains intact. At least until your clear out your cookies. Brilliant!!! Thanks for the note–this is so helpful. Kudos!